The U.S. Dept. 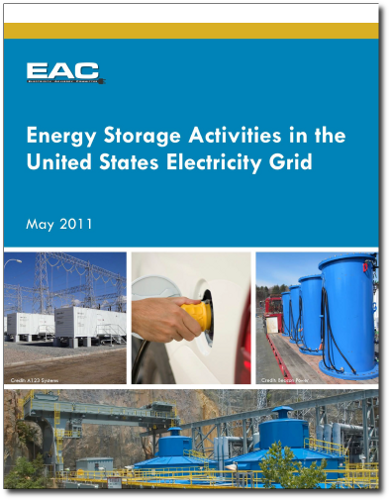 of Energy (DOE)’s energy storage program provided $185 Million in federal matching funds during 2009 to support energy storage projects valued at $771 million. The funding from the American Recovery and Reinvestment Act (ARRA) resulted in almost 538 MW of new energy storage being added to the grid. 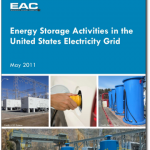 The new storage involved five principle energy storage demonstration project categories: Battery Storage for Utility Load Shifting, Ancillary Services, Distributed Storage for Grid Support, Compressed Air Energy Storage, and Promising Storage Technologies. The DOE Electricity Advisory Committee’s final report is available for download (PDF, 589 kb). Deploy a wind energy storage demonstration project at the Notrees Wind power Project in western Texas. The project will demonstrate how energy storage and power storage technologies can help wind power systems address intermittency issues by building a 24 megawatt (MW) hybrid-energy storage system capable of optimizing the flow of energy. Deploy a 25 MW – 75 MWh EnergyFarm for the Modesto Irrigation District in California’s Central Valley, replacing a planned $78M / 50 MW fossil fuel plant to compensate for the variable nature of wind energy providing the District with the ability to shift on-peak energy use to off-peak periods. Deploy and evaluate an 8 MW utility-scale lithium-ion battery technology to improve grid performance and aid in the integration of wind generation into the electric supply. The project will evaluate wider range of applications for li-ion batteries that will spur broader demand for the technology, bringing production to a scale that will make this form of large energy storage more affordable. Design, build, test, commission, and operate a utility-scale 20 MW flywheel energy storage frequency regulation plant in either Hazle Township, PA or Chicago Heights, Illinois, and provide frequency regulation services to the grid operator, the PJM Interconnection. The project will also demonstrate the technical, cost and environmental advantages of fast response flywheel-based frequency regulation management. Demonstrate 1 MW vanadium redox battery (VRB) storage system at the 32 MW municipal coal fired power plant in Painesville. The project will provide operating data and experience to help the plant maintain its daily power output requirement more efficiently while reducing its carbon footprint. Demonstrated proof of concept for aggregated Community Energy Storage Devices in a utility territory. The project is comprised of the following major research objectives: 1) The 20 Community Energy Storage (CES) devices across a utility territory; 2) The installation and use of a centralized communication across the service territory; 3) The integration of a renewable resource with energy storage; 4) The creation of algorithms for dispatching CES devices for peak shaving and demand response; 5) The integration and testing of secondary-use electric vehicle batteries; and 6) The use of Energy storage devices to provide ancillary services to the power grid. Demonstrate the economic and technical viability of a 3MW grid-scale, advanced energy storage system using the lead-carbon UltraBattery technology to regulate frequency and manage energy demand. Demonstrate competitively-priced, multimegawatt, long-duration advanced flow batteries for utility grid applications. This three-year project incorporates engineering of fleet control, manufacturing and installation of five 500-kW/6-hour TransFlow 2000 energy storage systems in California and New York to lower peak energy demand and reduce the costs of power interruptions. Demonstrate how a 2.5MWh Advanced Lead Acid flow battery along with a sophisticated control system turns a 500kW solar PV installation. into a reliable, dispatchable distributed generation resource. This hybrid resource will mitigate fluctuations in voltage normally caused by intermittent sources such as PV and wind and simultaneously store more energy for later use when customer demand peaks. Demonstrate an advanced, less costly 150 MW Compressed Air Energy Storage (CAES) technology plant using an existing salt cavern. The project will be designed with an innovative smart grid control system to improve grid reliability and enable the integration of wind and other intermittent renewable energy sources. Build and validate the design, performance, and reliability of an advanced, underground 300MW Compressed Energy Storage (CAES) plant using a saline porous rock formation located near Bakersfield, CA as the storage reservoir. Partner with Carnegie Mellon University to demonstrate a new, low cost, long-life, highly efficient, environmentally friendly, stationary energy storage battery that uses a proven and fully novel cell chemistry. Specifically, an aqueous sodium-ion based electrolyte is used in conjunction with simple highly scalable electrode materials housed in low cost packaging. Develop and demonstrate an innovative flywheel technology for use in grid connected, low-cost bulk energy storage applications. This demonstration effort, which partners with AFS Trinity, will improve on traditional flywheel systems, resulting in higher efficiency and cost reductions that will be competitive with pumped hydro technologies. Demonstrate a prototype flow battery system with an intermittent renewable energy source – a helios dual-axis tracker photovoltaic system. The project will combine a proven redox flow battery chemistry with a unique, patented design to yield an energy storage system that meets the combined safety, reliability, and cost requirements for distributed energy storage. Develop and deploy a 25kWh prototype battery system based on Seeo’s proprietary nanostructured polymer electrolytes. This new class of advanced lithium-ion rechargeable battery will demonstrate the substantial improvements offered by solid state lithium-ion technologies for energy density, battery life, safety, and cost. These batteries would be targeted for utility-scale operations, particularly Community Energy Storage projects. Design, build, and deploy a utility-scale, low-cost compressed air energy storage system to support the integration of renewable energy sources onto the grid. The 1 MW/4hr system will store potential energy in the form of compressed air in above-ground industrial pressure facilities. The technology utilizes isothermal gas cycling coupled with staged hydraulic compression and expansion to deliver an efficient and cost-effective energy storage solution.